The 2019 Marathon: FINISH Training Program is a 17 week program meeting three times a week. It is designed to prepare runners and for their first ever endurance event or for athletes who want a training program with less volume. This program will educate on endurance training principles, hydration and nutrition techniques, body awareness, pacing and running autonomy. This 2019 season will be geared towards the Fort 4 Fitness Marathon on September 28, 2019. However, our Coaches can help you train for any fall race you choose! 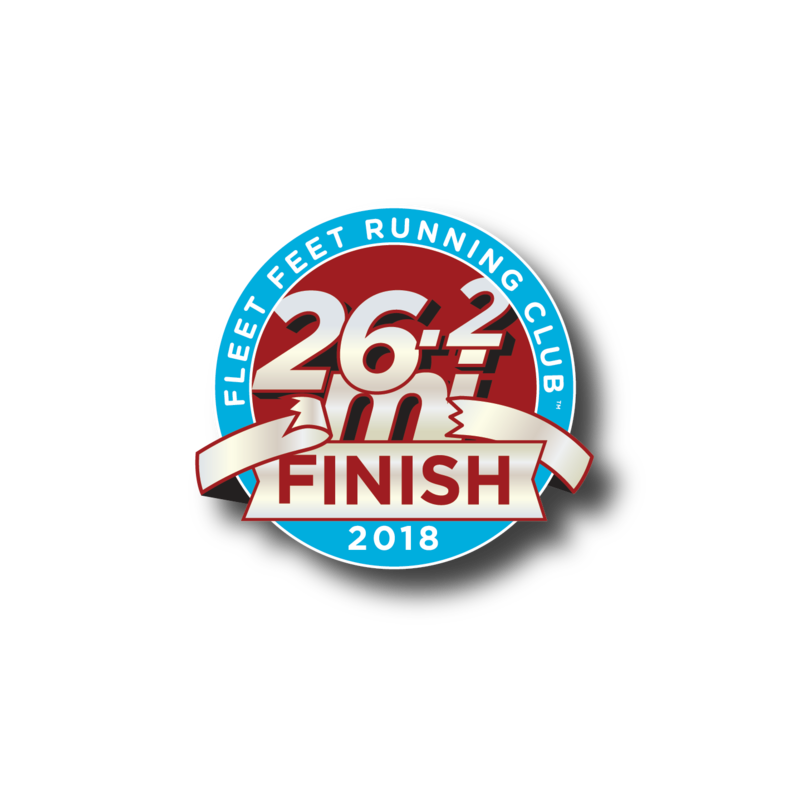 Everyone who completes this program (attends 75% of the group workouts) will earn a special Fleet Feet Running Club Marathon: FINISH patch (see below)! We are excited for all the fun 2019 will bring us! The Saturday Long run focus is on time on your feet. We use the long run to build up our endurance so that we can finish our distance races healthy and happy! Overall, these long runs should be at a very easy pace. We don’t want to race through the long runs because it will ultimately come to us feeling like we’ve ‘raced’ every weekend - our bodies will be tired and it increases the likelihood of injury. You can expect your Mentors to lead the way and help set the pace. These long runs are fully supported with a Key Drop at the store, Water and Nuun (electrolyte drink) stops on the course, turn-by-turn directions, and access to your Coaches for questions and advice. We recommend coming into the training being able to run or run/walk 7 Miles. For participants under 18, please contact the Training Program Coordinator, Kevin (kevin@fleetfeetfortwayne.com) before registering. Don't worry if this seems like too much check out our Half Marathon: Finish Training. Ready to run with us? Register.